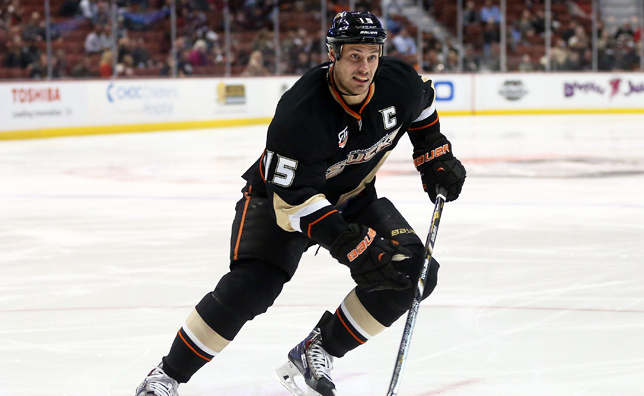 The National Hockey League Players’ Association (NHLPA) announced today that Anaheim Ducks captain Ryan Getzlaf has been named a finalist for the 2013-14 Ted Lindsay Award. Getzlaf joins Pittsburgh’s Sidney Crosby and Philadelphia’s Claude Giroux as the three nominees for the award, presented annually to the “Most Outstanding Player” in the NHL as voted by fellow members of the NHLPA. Getzlaf, 28 (5/10/85), is the second Ducks player in the last four seasons to be named a finalist for the award, joining Corey Perry in 2010-11. Getzlaf, who is also a finalist for the 2013-14 Hart Memorial Trophy and 2013-14 Mark Messier Leadership Award, is looking to become the first Ducks player to receive the “Most Outstanding Player” award. Selected by Anaheim in the first round (19th overall) of the 2003 NHL Entry Draft, Getzlaf scored 31-56=87 points with a +28 rating in 77 regular-season games. The 6-4, 221-pound center led the Ducks in scoring, assists and power-play points (23), and ranked third in plus/minus. He set career highs in goals and game-winning goals (7), while finishing second in the NHL in scoring, fifth in assists, tied for sixth in even-strength goals (26), and tied for second among forwards in blocked shots (87). Getzlaf also recorded a 14-game point streak (6-11=17) from Nov. 15-Dec. 15, tied for the NHL’s best in 2013-14, while his 31 penalty minutes (PIM) marked his lowest total since his rookie season in 2005-06 (22). He missed only four games due to injury during the regular season, including three to an upper-body injury from Nov. 10-14 and one to a lower-body injury on Jan. 11. A native of Regina, Saskatchewan, Getzlaf helped the Ducks finish with the top record in the Western Conference for the first time in franchise history and set season records for standings points (116), wins (54) and win (points) percentage (.707) in 2013-14. Anaheim led the NHL in goals (263) for the first time in club history and also established season bests for goals, wins, home wins (29), road wins (25), home points (62) and road points (54).